Since mid-April BBC audiences have seen and heard a number of reports informing them that “progress” is being made by women in Saudi Arabia looking to secure their basic human rights. April 13th 2015: “Saudi women’s small steps on path to progress“, Barbara Plett Usher, BBC News website. April 13th 2015: “Everyday life for Saudi women”, Barbara Plett Usher, BBC World Service radio – now unavailable. 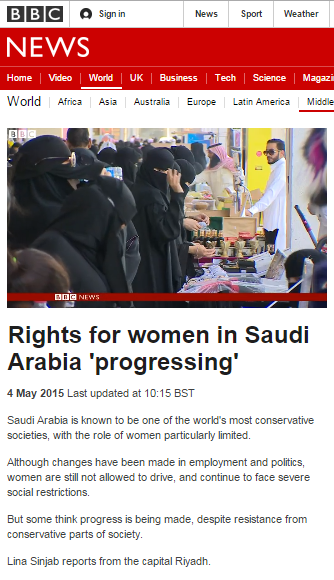 May 4th 2015: “Rights for women in Saudi Arabia ‘progressing’“, Lina Sinjab, BBC television news and BBC News website. “Saudi Arabia is known to be one of the world’s most conservative societies, with the role of women particularly limited. Although changes have been made in employment and politics, women are still not allowed to drive, and continue to face severe social restrictions. But can the severe restrictions on women’s rights in Saudi Arabia (ranked 130th out of 142 on gender equality in 2014 by the World Economic Forum) really be accurately described as “social”? In fact – in common with many other restrictions on human rights in general in Saudi Arabia – the restrictions on women are legal ones – derived from interpretations of Sharia law. “Women are not treated as equal members of society, and many laws discriminate against them. They are not permitted to drive cars or travel within or outside of the country without a male relative. According to interpretations of Sharia in Saudi Arabia, daughters generally receive half the inheritance awarded to their brothers, and the testimony of one man is equal to that of two women. Moreover, Saudi women seeking access to the courts must be represented by a male. The religious police enforce a strict policy of gender segregation and often harass women, using physical punishment to ensure that they meet conservative standards of dress in public. All sexual activity outside marriage, including homosexual acts, is criminalized, and the death penalty can be applied in certain circumstances. Education and economic rights for Saudi women have improved somewhat in recent years, with more than half of the country’s university students now female, though they do not enjoy equal access to classes and facilities. Women gained the right to hold commercial licenses in 2004. In 2008, the Saudi Human Rights Commission established a women’s branch to investigate cases of human rights violations against women and children, but it has not consistently carried out serious investigations or brought cases against violators. There is obviously a world of difference between “social restrictions” born out of convention and punishable restrictions enshrined in the laws of a non-democratic theocracy. A social restriction would be if, for example, women dressed in a certain way because of convention but their right to wear whatever they like was protected by law. Unfortunately, the BBC’s journalists do not seem to have an interest in accurately informing their audiences of that crucial difference.